The view from here is mighty nice. 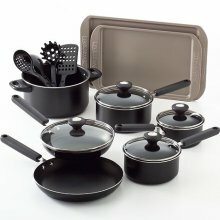 This cookware set has everything you need to create fantastic meals. In an attractive black metallic exterior. Aluminum construction has machined bases that sit firmly on a burner, so you get superior heat distribution. Nonstick interiors offer quick food release and easy cleanup. Sturdy, stay-cool, riveted handles provide a safe, comfortable grip. See-through glass lids allow you to monitor cooking without allowing flavor to escape. Included serving utensils and two bonus cookie sheets complete your cookware collection.